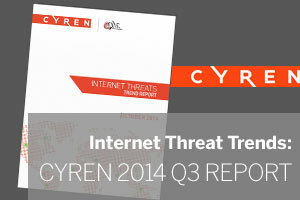 Cyren’s quarterly Internet Threat Trends reports are a MUST READ for IT professionals and MSP’s alike and this one is no exception. You could be forgiven for not recognising the Cyren name as they’ve recently rebranded from Commtouch, however Cyren are a huge player in the world of Internet security and provide the technology used by industry giants such as Google, Microsoft, Intel and T-Mobile. Their real-time threat protection and antivirus engine also powers both MDaemon Messaging Server and SecurityGateway for Exchange. This report highlights how, in the third quarter of 2014, early attention was focused on celebrity (Apple iCloud) account hacking and corporate data breaches. By the end of the quarter, IT professionals were reminded again that no system is perfect with the announcement of the Shellshock bug affecting the BASH shell. Cybercriminals have also used global tragedies, such as Ebola and airline disasters, to further enhance their phishing, spam, and malware distribution efforts. Diet spam featured heavily, accounting for 31% of all spam emails this quarter, and The Russian Federation, followed by Vietnam continue to hold the top spots for zombie countries. The full report sponsored by MDaemon and SecurityGateway developer Alt-N Technologies is available for download without registration below. ← Archiving Office 365 with MailStore just got even quicker!